d-bloc18 reinvents the classic notepad. Meet d-bloc18. A unique collection of bright and bold graphic notepads. Bastet & Bee reimagine the traditional page of the classic notepad and create unique graphic compositions to stimulate creativity. The concept behind the designs aims to break free from the straight lines found in traditional notepads, knowing that these sometimes guide us without letting us take any risks and keep our juices flowing. The page is no longer this wall that blocks ideas but a real playground that helps them run in all directions. 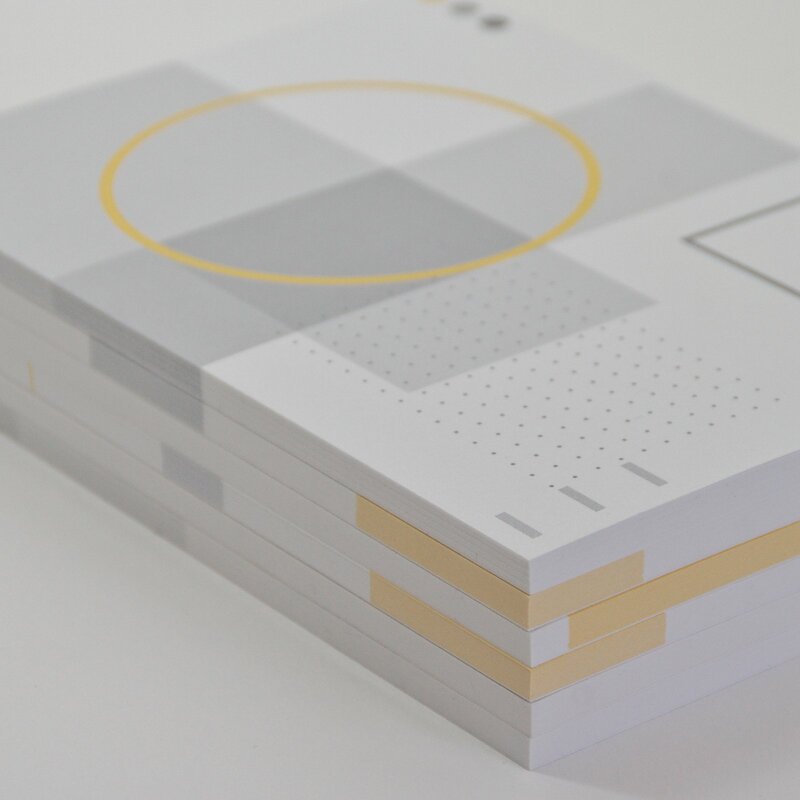 The result is a collection of six notepads with pages presenting unique graphic compositions that take inspiration from geometric art. The new arrangement invites the user to approach them from a new angle and allow themselves to get a little crazy from time to time. With a circle, line or dot as the starting point for a thought or desire, the notepad comes handy to jot down ideas as they come without worrying about order and structure. It is always possible to come back and easy to make connections. Ideas are no longer limited in space and time! The possible uses are also unlimited. Whether it is to find inspiration, create, plan, organize, study, memorize, clarify your ideas or let your thoughts wander, these notepads will always be useful. Love the concept and its making my to do lists much more enjoyable and fun! I’ve actually being using the wallpaper one and it’s fab! Each one of the 50 pages is printed identically on one side and blank on the other side to develop further all the collected ideas. No more creative blocks! And because we are all the same with ideas rolling around in our heads and all different when it comes to take notes, the brand offers notebooks that can be used everywhere, for everything, in portrait or landscape mode and is equally suitable for right-handed and left-handed people. In French we like to see them as “blocks that unblock” – des blocs qui débloquent. Every little detail has been considered including the use of sustainable paper.